Welcome Lynn. Please tell the readers about yourself and the books you write? Hi, everyone! I live in South Central Pennsylvania with my husband, daughter, and a cat and dog that think they run the house. I write sweet romantic suspense/mysteries and sweet contemporary romances. Please tell us about your latest book. Do you have anything new in the works and can you tell us a bit about it? Whiskey Whispers of the Past is my current release. It is a sweet romantic suspense set in the fictitious town of Jonerstown, PA. The hero, Chance, is a recovering alcoholic looking for a new start and the heroine, Kendra, is just the person to help him on his journey. Jonerstown is a town I based off my current hometown. In both the real and fictitious town, the square houses a variety of businesses which are the basis for the On Main Street Series. Book two has recently been contracted. What inspired you to write Whiskey Whispers of the Past? The inspiration for Whiskey Whispers of the Past came from a country song by Kenny Chesney entitled “That’s Why I’m Here.” The song tells of a man’s journey through alcoholism and his road to recovery. The song itself inspired a scene in the book. I try to write true-to-life stories. Yes, they are works of fiction, but I try to incorporate real life experiences or what I perceive to be true-life situations. 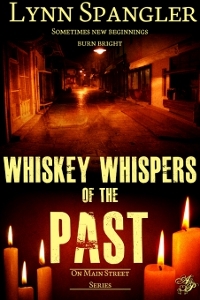 Whiskey Whispers of the Past has an element of revenge in it. Unfortunately, revenge is a mighty motivator in some people’s lives. The revenge added the gritty edge to my story. A string of strange happenings add up to a madman’s revenge plot. When writing who is in charge you or your characters? How do you deal with bossy characters? I take control of my characters but I let them have their fair share of time in the limelight. I develop them with traditional pen and paper then they tend to morph as I write them. Nine times out of ten, I go with their flow but sometimes I have to put my foot down and get them back on the right path. Is there anything you find particularly challenging about writing? The whole writing process can be challenging. I usually start out with a solid game plan then the story takes on a mind of it’s own. Sometimes it’s easy to follow the story’s path but sometimes I have to stick with my original plan no matter how loudly the story screams. That the best laid plans sometimes fall to the wayside and allowing that to happen. Never give up. You’ll more than likely get rejected as your writing style evolves and you find your voice. Rely on that voice. Don’t allow anyone to change it. Allow others to supply input but stick to your guns. You’ll find a style that suits you. My journey took me through two distinct writing styles. Now I found my true voice and comfort zone. Now for a fun question, what is in your TBR pile? Anything by Nora Roberts is in my TBR pile. She is my absolute favorite author. Her stories always reach out and grab me. My TBR pile has too many authors to mention but there’s a mix of romance and action/adventure in there. When did you know that you wanted to be a writer? Was your family and friends supportive? My husband was to one who actually persuaded me to become a writer. My nose was always buried in a book. He made an off-handed comment that I read so many books that I could write one. A few years later, here I am with a released novella, a short story in the editing process, and a recently contracted story. Who (if anyone) has been instrumental in inspiring you as a writer? My writing is a combination of what I find appealing by many authors. As I mentioned above, I’m a huge Nora Roberts fan but I also like authors like Clive Cussler, who isn’t a romance writer but I love his works nonetheless. What are you currently working on? Anything you can share regarding your current Work in Progress? The second story in the On Main Street series, Conflicted Jewel, has recently been contracted. I’ll be in the editing process with that story. My short story, Love Flourishes, is nearing the end of its editing journey and will be released within a month or two. Don’t forget to give us links to your website etc. Kendra thought her life was her store; Chance thought his revolved around his addiction. What if they’re both wrong? Looking for a new start, Chance Daniels moves from hectic, big city living to a small town in South Central Pennsylvania. He decides opening his own music store on Main Street will help him beat the demons of his alcoholism. He discovers the beautiful business owner from across the street may be the lift he needs to beat his addiction. But little does he know that parts of his past unbeknownst to him are about to come to light. Chance receives strange objects in the mail and the woman he falls in love with is nearly run down by a crazed driver. Kendra Strafford, owner of Strafford’s Candle Creations, finds herself drawn to the tall, handsome man from Los Angeles after starting a standing weekday coffee date with him. She can’t help but fall in love with him, despite his addiction and the strange happenings that seem to surround him. Her own brush with death only draws her closer to Chance. Was her accident just an accident or was it part of a more devious scheme arising from Chance’s hidden past and will they overcome the bizarre occurrences besieging them to explore their developing love? Kendra peered out the front window of her candle shop, Strafford’s Candle Creations, toward the brick façade of the adjacent building. She saw the local real estate agent and her good friend, Nancy Lewis, walking toward the old structure. The converted row house had once contained Donaldson’s Hardware Store, which had been a fixture of Main Street, right across from Kendra’s establishment. “Oh, yeah? I wonder what business someone would put in there,” her assistant Deanna commented. Glancing around her shop, she surveyed the three rows of gleaming glass shelves filling two walls of the sales floor. Floor units graced the center of her shop, reflecting the brilliance of the morning sun against the ceiling of the store. The shelves were stocked with candles in a vast array of sizes, shapes, colors, and scents. She inhaled, marveling at the combination. Oh, how she loved the fruits of her labor. Every day her wares brought a feeling of warmth and pride. She strode to the storefront, unlocked the door, flipped the Closed sign to Open, and went about dusting the shelves while rearranging a candle or two along the way. Yeah, too bad. The body is killer. I love to write and read. I also make jewelry when the mood strikes. I’m a huge sports fan. I love football, NASCAR, and hockey. I’m also a bit of a game show freak. I love old game shows from the 70’s and 80’s like Match Game and $25,000 Pyramid. Television shows like Criminal Minds and The Voice are also favorites of mine. Thanks so much for having me today! Everyone have a fantabulous day! It’s been fun getting to know you Lynn! Whiskey Whispers of the Past sounds like a great read – definitely going on my TBR list!